Sauces? We don’t need no stinking sauces. Love (of pork and bread) is all you need. DESTIN, Fla. – It takes guts to open a cash-only restaurant with no indoor seating in a place where the temperature routinely hovers between 90 and the fires of hell. It takes even more guts to serve a pulled-pork sandwich completely untouched by sauce. Sure, Lillie’s Q serves sauce. Charlie McKenna’s sauce recipes were inspired by his grandmother, Lillie, who taught young Charlie the magic of southern cuisine in her kitchen in Greenville, S.C. McKenna created six varieties of sauce to serve at the original Lillie’s Q in Chicago and the Redneck Riviera offshoot run by his parents, Quito and Teresa. But the McKennas apparently understand the cardinal rule of great barbecue. If the meat is truly great, it requires no sauce. To serve a sandwich unsauced is the ultimate statement of pitmaster self-assurance. After peeling off the wax paper surrounding my pulled pork sandwich, I smiled. The clerk hadn’t asked me which sauce I wanted, but I assumed I would find a healthy dollop of the least risky sauce Lillie’s makes. Nope. 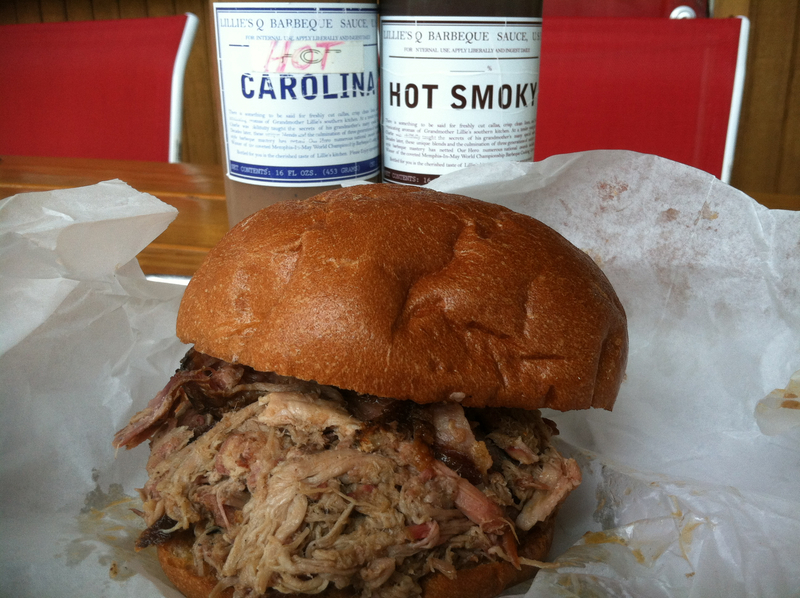 Under the soft wheat bun sat nothing but a pile of pork pulled from a shoulder smoked low and slow. Juices bubbled as I squeezed the bun pieces together and took the first bite. The ensuing flavor explosion explained why people still line up for barbecue in a place that offers them no air conditioning and no credit-card convenience. I also ordered half rack of ribs. This was a mistake. For a dollar more than the price of the babybacks*, I could have ordered two more pulled pork sandwiches. I would have happily devoured them both. *Bless the hearts of those who smoke babybacks, but there just isn’t enough fat on them to keep them moist. 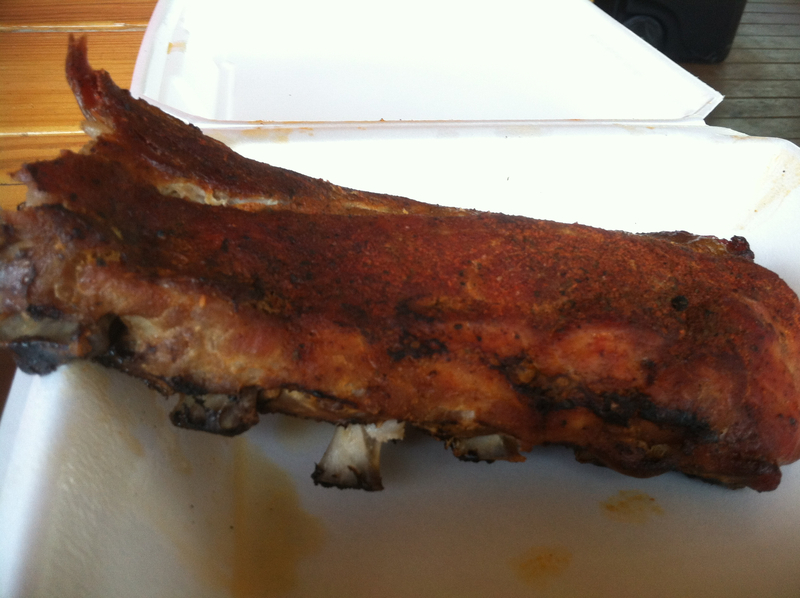 One of these days, I’ll learn to stick to ordering spare ribs. I did try a few drops of sauce during the next few bites of my sandwich. The Hot Carolina was a capsaicin-enhanced version of the vinegar-based sauces available in North Carolina. The Hot Smoky was a peppered version of a tomato-based sauce. Unlike so many joints that embrace the bland, the McKennas don’t insult a diner’s taste buds by applying the word “hot” to a sauce that lands one or two Scoville Units to the right of frozen. Lillie’s hot sauces kick like a mule. 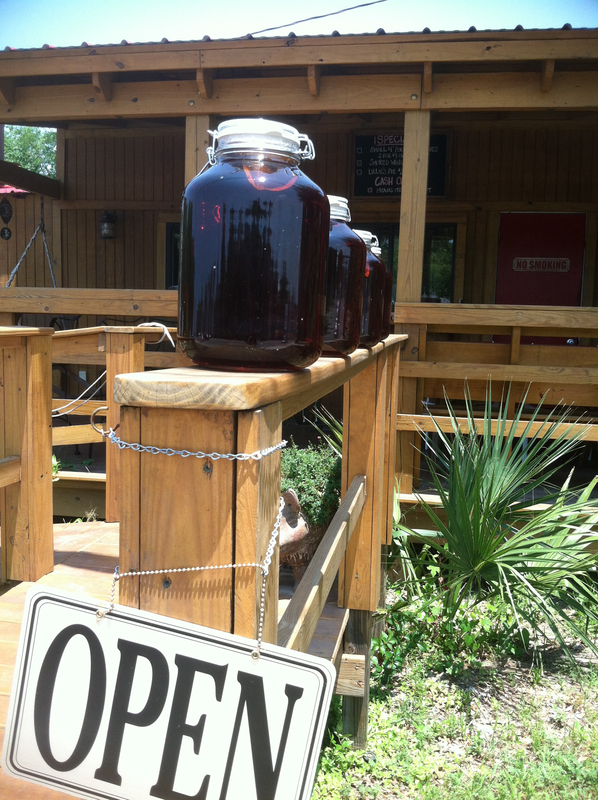 That’s perfect, because Lillie’s serves sweet sun tea to cool the palate. Still, I couldn’t bear to eat more than a few bites of the sauced pork. I worried applying more sauce would be an insult to the maestro who smoked the meat. The rest of the sandwich traveled to my stomach as a perfect marriage of pork and bread with no liquid mistress to come between them. Sweet tea the old-fashioned way. This entry was posted in BBQ, Sammiches, Sweet Tea and tagged BBQ, Destin restaurants, Pulled pork. Bookmark the permalink. 1 Response to Sauces? We don’t need no stinking sauces. I smoke baby backs all the time – they are tricky though and they MUST be wrapped in foil for 30 minutes during the last hour or so (with 15 minutes outside to end in a crunchy exterior) Still… it’s hard to beat good pulled pork.